Light: Taking swift action. Moving forward with a plan as quickly as possible. Energizing yourself. Adapting to sudden changes. Taking setbacks in stride. Embracing the idea that nothing stays the same forever. Reacting quickly and appropriately to unforeseen problems. Shadow: Giving in to panic. Running in circles and screaming. Insisting things must always stay the same. Stirring the pot just to see what will happen. Rushing others. Refusing to re-evaluate a schedule or program, even when it’s clearly no longer appropriate. Story: The Main Character’s adaptability is tested when he or she is thrown into unforeseen circumstances. Relationships. People and situations are always changing; the key is deciding whether you want to grow together…or grow apart. What worked once might not work later; on the other hand, those you dismissed before might now be perfect mates. Embrace change, and you’ll be surprised at how quickly good things happen. Work. Yesterday’s solutions aren’t going to solve today’s problems; in minutes, innovations become old news. Shake things up. Tap into a new stream of information. Bring in an expert from outside. Juggle your hours. Your adaptability will atrophy if you don’t exercise it with new challenges. Spirituality. Become aware of patterns of change: the seasons, the phases of the moon, the steady progression of the Church calendar. Time is passing faster than you realize, and using your faith as a means to honor and appreciate that transition will help you better appreciate the time you have. Personal Growth. When things change, do you tend to procrastinate, or respond right away? Handling something now—taking action as soon as possible—can keep a small issue from becoming a large stumbling block. Resolve to handle challenges as soon as you possibly can. Fortune Telling. Watch for a surprising letter in the mail. Your whole world is about to be turned on its ear. Flying Wands. Waite, in The Pictorial Key to the Tarot, suggests the eight Wands seen on RWS-inspired versions of this card are just shy of impact. If your worst case scenario suddenly became reality, what would your action plan be? The Pastoral Landscape. The quiet landscape seen in RWS versions of this card represents the calm before the storm. Even in times of peace, a wise person watches for incoming Wands…and prepares to deal with the changes generated by their arrival. Reflexive Action. Are your actions driven by reflection … or reflex? By what criteria would you judge your own response to a crisis? The Marseilles Image. 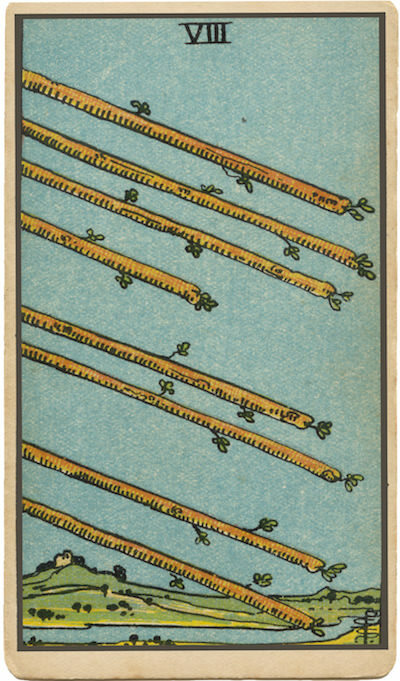 The Marseilles Eight of Wands presents a lattice even sturdier than the one last seen on the Six. We’ve wrapped our mind around the new influence that arrived with the Seven, and now we’ve integrated the new idea into our Work. The result? We’re more stable than ever before. How quickly to you adapt to change? What would your response be to overwhelming, sudden change? What changes are on your horizon? How well have you prepared for them?